While still young and limited in size, ClickTale’s analytics were abundantly clear that the overwhelming majority of visitors who were interested in a vehicle purchase and started on our homepage headed immediately to our inventory and stayed there for their entire browsing session. 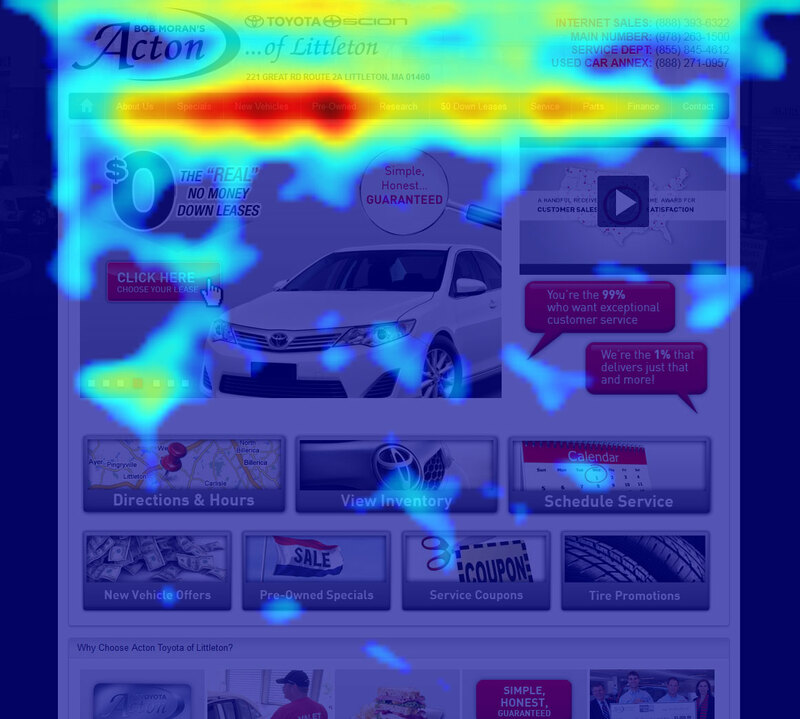 See below for a ClickTale heatmap of our homepage. At its face, this information may seem like it is pretty common knowledge and of little real value. However, consider, then, that much of your website content meant to differentiate your dealership and brand from the competition goes unseen by your potential customers. This means visitors are not reading your wonderful testimonials located under your “Dealership” section nor can they be impressed by your exclusive ownership benefit program (i.e. complimentary oil changes for life) promoted within the “Why Us” section. Moreover, visitors are unaware of the unique sales pledge or customer-centric, no haggle sales process they will receive should they do business with your store. Unfortunately, that information is situated only under the “About” section. It is imperative this valuable information be placed where it can be seen – your VDPs. Below, you will find a screenshot for one of our newly created Vehicle Detail Pages (VDPs). Within the page, we’ve highlighted a number of the ways we’ve tailored our VDPs to increase the likelihood of conversion by ensuring visitors find what they want to know about the car, but also discover what we want them to know about us as a dealership and the brand we sell. We encourage all of you to evaluate your own VDPs and ask yourself whether they include your store’s and manufacturer’s unique offerings, benefits, etc., thus increasing the odds a visitor will be motivated to pick up the phone and call or complete a contact form. If you feel your VDPs need improvement and you cannot customize them on your own due to CMS restrictions, we suggest you reach out to your website provider for assistance. There may be a small fee for the custom work, but the additional lead volume will more than make up for the expense in no time. When was the last time you worked with your website provider to help improve your VDP? ClickTale is an amazing tool. I used their services on my dealer website years (2008ish) when they first introduced their video recording sessions for each new user on your website. The information and seeing what customers where really doing on a dealership website was extremely informative (but also expected – straight to the inventory). The VDP is THE page. The design and “flow” of this page is so crucial for experience and conversion. Ben and Jason – you gentleman are Clicktale extremist. Thanks for sharing here on DealerRefresh how your using ClickTale to improve your Acton Toyota website. Any dealers looking for information on Acton Toyota’s experience with ClickTale or to further discuss strategies to improve your overall website and VDPs, you can contract Ben Koller or Justin Brun at [email protected] or 339-707-5095. Ben and Justin – you gentleman are Clicktale extremist. 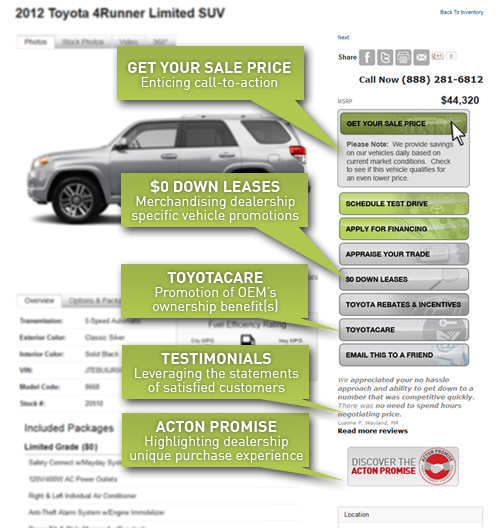 Thanks for sharing here on DealerRefresh how your using ClickTale to improve your Acton Toyota website. Thanks guys for sharing your findings. It really puts things into perspective with what dealer website vistors are doing on your site. I love your VDP’s… work of art. The use of different colours (that’s how we spell it in Canada) to focus on certain calls to action is a great idea. We’ve achieved some great results using http://www.sessioncam.com as well.